Spur productivity in a comfortable atmosphere by planning a day meeting at The Parlour Inn. Stratford is a lively town that is centrally located between several major cities in Southwestern Ontario. Enjoy world-renowned theatre productions that make Stratford a "must-visit"
Position your team for success with a fun and focused meeting at The Parlour Inn. Take advantage of an exceptional venue in a great location. Savour upscale amenities, delicious catering and timely service in comfortable meeting spaces. 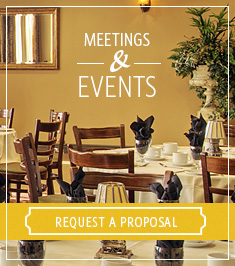 Contact The Parlour Inn to start planning your meeting.